It’s interesting to compare the delivery strategies of these two sites, which both appear top of the organic listings; neither website gets it right in my opinion. 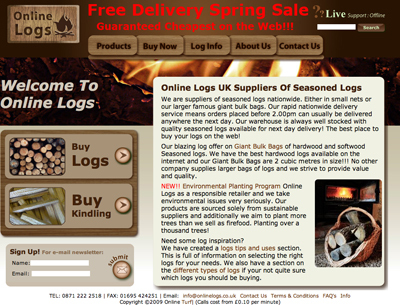 The first site, Onlinelogs.co.uk has good call to action (big buttons to “buy logs” and “buy kindling”). You are then given a quite sophisticated-looking pop up map of the UK which 5 or 6 coloured zones, although we’re not told the key to the zones. You then select your postcode area either by clicking on the map or from a drop-down menu. Only then can you see the products available, except that there are no prices – to see the price you need to enter a quantity of bags and click to get the quote, which includes delivery. Which is just as well as the header of the site promises Free Delivery in big red letters. It all seems needlessly complex, and not very customer friendly. 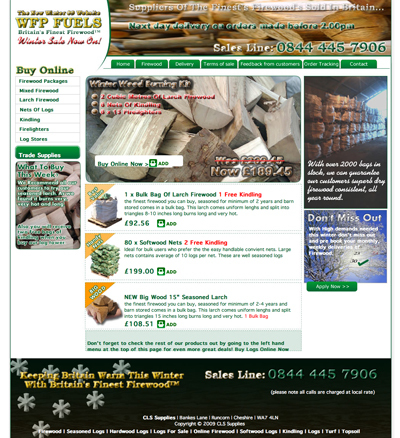 The second site shows prices and does actually offer free delivery (on orders over £50 which is most products). Although – ironically – it doesn’t inform the customer that delivery is free; not on the product pages, not in the shopping cart and not even on the delivery tab on the top menu. Stating clear delivery costs throughout the site is one of the most effective ways to improve conversion rate on an ecommerce site; offering free delivery is even better. This is true of any ecommerce site, even more so when your product is bulky and heavy like firewood. With a small amount of consumer testing and/or using Google analytics both of the these websites could improve conversion considerably. This has worked well for us, however, as you rightly point out the products do not have clear prices at the product level. This is a limitation of the commerce system itself. Keep up the good work, I look forward to seeing more from your site.